Share an assortment of heavenly bakery treats with someone special or set out this delicious array at your next celebration. 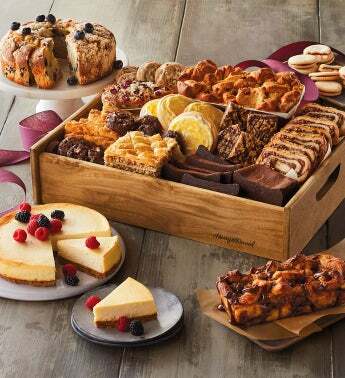 Among the goodies are New York-style cheesecake, apple fritter pull-apart bread, honey-sweet baklava, an assortment of scrumptious cookies, and much more. It all arrives in a reusable wooden tray.